Hot Tub Accessories – This Is Why You Need Them! 6. Get Your Pong On! There may be nothing better than a hot tub for your health, or for having a great time with friends. Once you realize the benefits of setting up your hot tub you may find that you are ready to take the next step. The good news is that the perfect hot tub accessories can make your experience that much more enjoyable. Whether you chose a plug and play hot tub or a portable hot tub for the ultimate party on the go, the best hot tub accessories can make every trip to your hot tub even better. Not sure where to start to find the best hot tub accessories? We have you covered! Check out our guide to the 13 best accessories and let the fun begin! Let’s slip into the tub and stay awhile. You might remember the James Brown Celebrity Hot Tub Party from Saturday Night Live. Eddie Murphy played James Brown and had a full band beside his hot tub for the ultimate hot tub party. While it might not always be realistic to have a full band poolside as the best in hot tub accessories, there is no doubt you will want to bring the party along for your times in the hot tub. Soundcast offers a variety of outdoor speaker systems that are wireless and waterproof. Plus, their outdoor wireless audio brings big sound to the party. With great designs, Bluetooth connectivity, a Play-Fi chipset and equalization modes, you have full control of your favorite party anthems with the Soundcast outdoor audio products. Besides sounding great, these speakers look the part. They will enhance your outdoor area near the pool, or provide the best dance party for your hot tub guests. Don’t leave the party indoors when enjoying your hot tub. The right speaker system for parties is a must have in terms of hot tub accessories. There’s a time and a place for everything. And while there is no better place than your hot tub, different times call for different moods. You may not always want to get the party started with major bass grooves during your hot tub time. Just as important is having some mood music to unwind to at the end of a busy day. You may already know that a hot tub visit at the end of the day can help you sleep better at night. It relieves muscle tension and increases circulation. An intimate music source to help you meditate and relax is more important than keeping the party going at these times. Why not try the a for these more calming times? This speaker system pairs with your cellphone and floats around the hot tub as you listen to the music of your choice. With 6 hours of rechargeable battery life you’ll have plenty of time to set the mood with the Lightahead. And speaking of mood, the sound quality is so consistent you will have zero disruptions. The Lightahead will allow you full relaxation mode on those calm nights and early mornings you get deep sighs of relief in your hot tub. Tired of meeting in your friend’s garage or musty basement for poker night? Why not take the stogies out to the hot tub and deal up some great games with your friends for the next round of card games? Your friends are sure to bring the food and fun if you’re the one hosting poker night in your hot tub. Just make sure you get a deck of waterproof cards as your next hot tub accessories to make the games go off without a hitch. We all know you don’t need to worry about the poker chips getting wet, but a soaked deck of cards is sure to spoil the fun. Luckily, Hoyle and Coleman– and other leaders in the playing card industry– offer waterproof cards so you can have great fun playing in the hot tub. For less than 10 bucks you’ll open up a wealth of possibilities too. You don’t have to limit the games to poker night. There’s nothing more difficult than getting the kids to sit still. Offer a game of Go Fish with your new waterproof cards, and you can play poolside or right in the hot tub. There are few hot tub accessories as inexpensive and fun as waterproof playing cards. Two of our favorite things to unwind are times in the hot tub and a good book. Unfortunately, even if we prop our elbows up really carefully, and keep the pages clear of the water, the book takes a beating from the steam and heat. One sure fire way to get on the bad side of your local librarian is to take your loaner into the hot tub! But the Aqua Reader is one of the great new hot tub accessories and a must for every bookworm! Forget the fumbling around and wrecked paperbacks. The Aqua Reader holds your book for you! You don’t have to choose between reading time and hot tub time anymore with this great new gadget! More than anything, the best hot tub accessories should highlight the fun and relaxation your hot tub has to offer. And while some hot tub owners love a cool rain–or even snow–when they relax in their hot tub, some are hesitant to brave the elements when the weather is less than ideal. But you don’t have to let a rain day ruin a great hot tub outing for you and your friends! How about you invest in some umbrella hats for the whole party and let the good times roll? Umbrella hats are widely available on online retailers and are guaranteed to keep your head dry while the rest of you soaks in the hot tub. These are inexpensive hot tub accessories as well. You can keep the smiles going with a selection of different umbrella hats for your guests! Plus, the umbrella hat is adaptable. You can wear it to outdoor events for hands-free protection. Head out to a backyard barbecue or tailgating party these days and you are bound to see a great game of beer pong in session. And for those of you with a portable tub you are lugging along to the next Jimmy Buffett concert, a beer pong game in the hot tub sounds perfect! You can bring the best to a tailgate or backyard barbecue with floating beer pong. All of our favorite tub accessories show you don’t need to choose between dry land fun and hot tub awesomeness! The GoPong Floating Beer Pong set will get the game going right. But beware, drinking in a hot tub can be dangerous. Limit your consumption and make sure you keep the fun safe in your beer pong tournaments! Speaking of dangerous, many of us love our time in the hot tub so much we can take serious risks with our skin care. Remember, there are serious risks associated with sun exposure and skin cancer. If you’re like us, you don’t want to cut your time in the hot tub down though. A great and relaxing addition to your necessary tub accessories is a side spa umbrella for casting some shade on your outdoor hot tub area. The umbrella hat option may be great for keeping off the rain, but a better device for a sunny day is the side spa umbrella. You’ll get some relaxing shade and a great dip in your hot tub with this on your list of hot tub accessories. Not everyone is wild about poker or card games. And beer pong isn’t the greatest family entertainment available. But today’s hot tub accessories offer something for everyone. If a game of checkers, chess, or backgammon is more your speed then the Swimline Floating Multi-Game Gameboard is the right one for you. This game board flips over to let players choose the game that suits them. Or you can have a tournament playing all 3! There is something special about time with the family laughing and playing games together. And choosing this Swimline game as one of your favorite tub accessories will have you relaxed for every move on the chess board. Another great addition when turning your hot tub into a relaxation paradise is the comfort of a pillow to lay back and relax. Hot tub accessories like a spa pillow can turn a backyard hot tub, or your deck, into an exclusive spa. Like all of the best accessories, the spa pillow comes in a variety of options. You can have the form-fitting comfort of your favorite massage therapist’s office or the sleepytime cushion of an upscale hotel pillow. Whatever our personal tastes, these waterproof luxuries will allow you to let go of the tension of the toughest days. Why not invest in a few different options to always suit your choice for that particular moment? If you like enjoying a cool drink in the hot tub you probably already know how easy it can be to make a mess. But those days of mixing drinks with the hot tub water are behind you when you choose an inflatable spa bar as one of your favorite new hot tub accessories. An inflatable spa bar is versatile. It floats and also can be attached to the side of your hot tub. Forget spilling drinks while trying to grab a glass of ale as it floats on by. With the inflatable spa bar, you can make plenty of room for guests, serve up the fun, and adapt to the needs of your family. Ready to jump in the hot tub? But what about lugging that heavy cover out of the way first? If you’re anything like us you’ve skipped the hot tub at times because you were too exhausted from a long day to want to move the cover off! A spa cover lifter is essential in terms of hot tub accessories. It will make getting in and out of your hot tub a snap. Speaking of getting in and out of your hot tub, how easy are you making it for all your guests and your family? Just like avoiding the hot tub because of the cover, do you have guests who are shy to try and get in? The best solution is spa storage steps. You get the benefit of additional space to store all your cool new accessories, as well as better ease of access for everyone who wants to enjoy the hot tub with you. Putting the wrong aromatherapy or calming bath salts in your hot tub can be a disaster. You can do damage to your hot tub and leave a mess to clean up. But the right bath salts are great tub accessories. They can help your muscles relax and make the most of every minute in your hot tub. 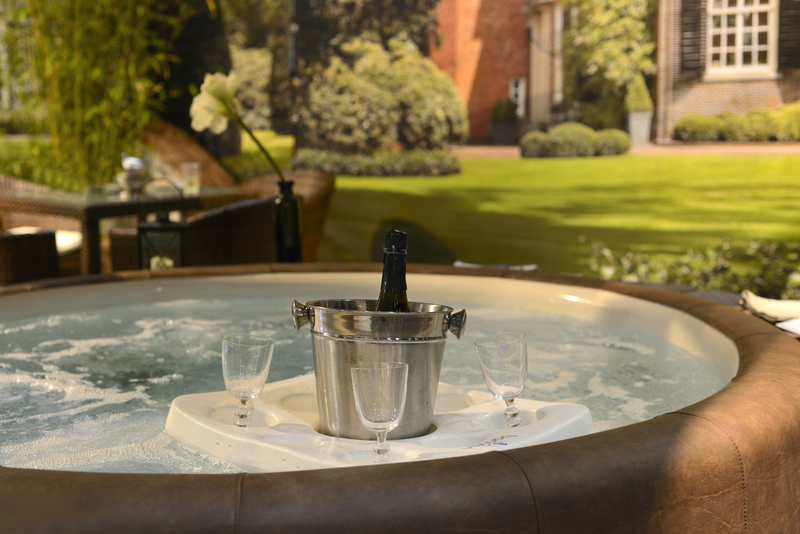 Once you know the wide range of great accessories you can enjoy your time in the hot tub in style. But remember, picking the best hot tub, and finding the best hot tub accessories is only part of what you need to know. Understanding how to properly maintain and repair your hot tub will also keep every trip to the tub as enjoyable as possible. And keeping up to date on the latest advances in technology, products, and services is a must for every hot tub aficionado. Take your experience to the next level. Hot Tub Advice offers everything you need to know about pools, hot tubs, saunas, and spas. Plus, we are constantly expanding our articles with new information on the latest trends and best new products. We help hot tub enthusiasts like you find the best information every day. Remember to enjoy your hot tub! And don’t forget to check back often for the latest news.